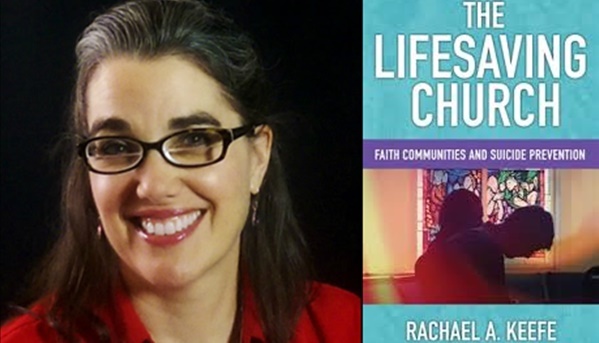 In this episode of the RavenCast, I sit down with Rachael Keefe to discuss her new book “The Lifesaving Church: Faith Communities and Suicide Prevention.” Rachael is the pastor at Living Table United Church of Christ in Minneapolis. 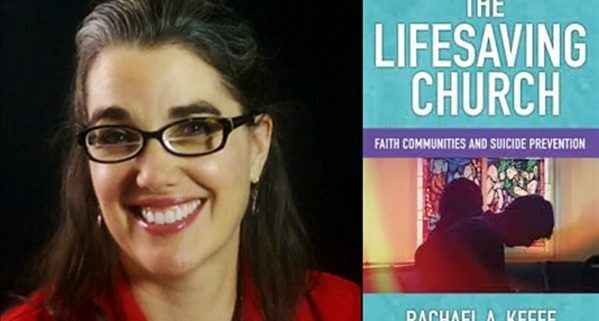 She has written four books and she blogs at Write Out of Left Field, Beach Theology, RevGalBlogPals, and the Christian Century. You can watch the video of our conversation below, listen to the MP3 above, or you can subscribe to the RavenCast on iTunes, Stitcher Radio, or Podbean. Much of Christianity is stuck in an archaic form of theology that says if bad things are happening to you it’s because you did something wrong and God is punishing you. This is dangerous, especially for those suffering with mental health issues. Archaic theology needs to be replaced by new theology that claims God is love. God loves all people and doesn’t curse or punish anyone. The Bible struggles with these two views of God. For example, in Deuteronomy, people are often seen as being punished if bad things happen to them. But it Ecclesiastes and Job, bad things happen to people who are innocent. We ultimately see this in Jesus. How Does “Psychache” Relate to Mental Wellness and Suicidality? Pscychache is the driving force behind suicidality. It refers to the unbearable pain that we experience from chronic unmet needs of love and community. Psychache often stems from a sense of feeling isolated. For most people, if their pain from psychache can be alleviated, they would not want to die. This is where community that can help hold someone’s pain becomes important because that sense of community can begin to give hope. Much of progressive Christianity claims that we are not like those Christians. This is an unhealthy way to form identity. Progressive Christians need to claim a positive identity that isn’t against other Christians, but is for something. When we do this, we simply behave in the same way as people who condemn the progressive sides who say, “That’s not the Christian you want to be.” Progressive Christains can claim, “We are Christians who seek to love God and neighbor as we love ourselves and care for creation as God intended.” We need to embody the love of Jesus and the realm of God that is among us. Many people in church feel alone and isolated, as if they are the only ones who are going through a mental health challenge. They often feel a sense of shame. Often times people just want to be able to express their feelings. If the pastor and other church leaders model how to do this and when to do this, it would go a long way to ending a sense of shame in the church. The biggest tool we have to deal with the continuum of mental wellness is education. Mental Health First Aid is an excellent resource for learning about mental health. Education is the most important way to understand that mental illness and help us to stop feeling afraid. Just as important responsibility is to show up. No one really remembers what we say, but everyone remembers that we showed up. Progressives and conservatives often respond to suicide loss survivors in a way that can lead to contagion, or the spreading of suicide attempts. For example, if progressives say to a suicide loss survivor that their loved one is in heaven and is free from pain, it can sound really good to someone who hears that. On the other hand, if someone says that a loved one is in hell because of suicide, a survivor may want to keep their loved one company and comfort, so they may attempt suicide. Progressives can also go in the wrong direction by saying God loves you no matter what. While this is true, if the only thing stopping someone from acting suicidal is the belief they will go to hell, it’s best to not take that belief away. It’s best to work on that person’s pain and then discuss theology later. God is not a fan of suicide. God doesn’t want anyone to live with suicidality, but prefers we find a way out of the pain. Hope emerges as we live in open and honest community where we can bring our whole selves – including our pain and brokenness. Hope emerges when members of the Body of Christ love one another as Christ has loved us. Hope emerges when we show up to be present with one another.